Designed with an everlasting wick, candlelight plays off subtle hues in this handblown glass oil candle. She was positively glowing. It made sense, as Jill Henrietta Davis' handblown glass oil candle sat on the dining room table. 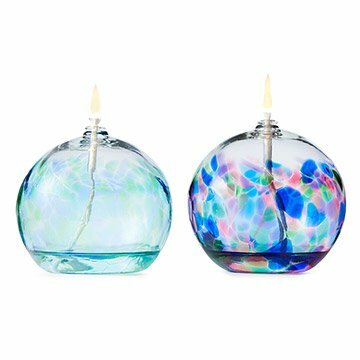 Designed with an everlasting wick, candlelight plays off the different hues in the glass and a "window" at the top allows a pool of light to cast color and shadow around the piece. Handmade in Pawtucket, Rhode Island. Oil not included. 3.5" H x 4" dia. Wash glass vessel with warm soapy water. Do not wet fiberglass wick. Lay wick flat on several paper towels and allow to dry completely before storing or changing oil scents. Set includes glass vessel, fiberglass wick and funnel. For use with paraffin oil (not included). These are beautiful and make a lovely addition to a lonely shelf! Beautiful!! Don't hesitate- just buy it! These are handmade and fit very well with the candles that I haven't broken. The design is beautiful and the way it lights up in a dark room is absolutely lovely. For $30, I did expect it to be a lot bigger, though. It is probably about the size of a grapefruit. No matter how much I adjust the wick, it still tends to get smoky. Overall, the way it glows in the dark is lovely to look at and can be calming. While it is a bit overpriced for its size, it makes a great gift for a loved one. I would definitely buy this as a hostess or thank you gift. I gave this as a thank you gift and it was beautiful. Everything I have ordered (and I have ordered quite a few things from different Artisans), have always been as described or better and come in the time frame promised or earlier. That is why I keep ordering. There are always new items and I prefer to support small vs big box businesses. Must place candle under dim light to get colors to show but then what's the point of the candle? Endless love for this candle! This candle adds the perfect touch of color and lighting to my mantle. Plan to buy several more for my buffet and to give as gifts too! You will love the soft glow these candles give off and there's no mess or wax to remove from your votive cups like there is with regular candles. Just refill with new oil and use "endlessly." The glass ball itself is very nice. It's easy to fill and, when it will burn, it is wonderful. That said, the wick requires constant attention. Yeah, it's a fiberglass wick. But it will not stay lit. The candle will burn for one hour or so and then the flame will get smaller and it will finally go out. To relight it, you need to brush the top of the wick to break up the clumped together strands, move it up and down a bit in the holding tube to "recoat" it with oil and then light it. It will burn high for a few minutes, calm down to a more "normal" flame then burn for an hour or so and go out. Repeat the steps and it will light again. Makes it a hassle if you want it to burn through a dinner party or some similar event. It was beautiful and just glowed when lite a great gift or just for yourself. I bought two of the turquoise creations for two very special teachers at the end of my children school year. I wanted something special, but practical. Fit the bill! The artist is based out of Rhode Island.